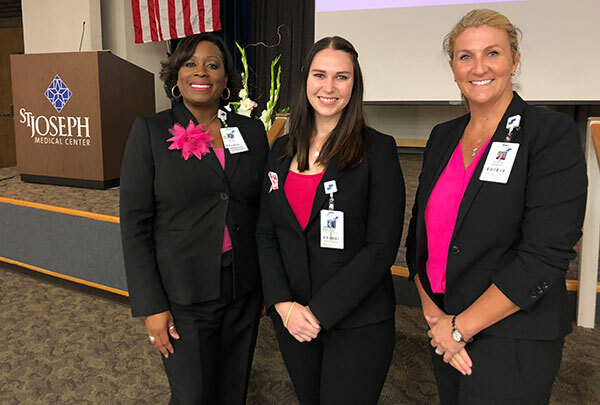 The battle against breast cancer—the second leading cause of cancer death in women—is best fought by early detection, screening mammograms and knowledge, agreed the medical experts addressing women attending the Third Annual Pink Power Luncheon at St. Joseph Medical Center October 19. Eniola Mudasiru-Dawodu, M.D., radiologist on the medical staff of St. Joseph Medical Center, encouraged the audience to begin annual screening mammography at age 40 and to continue beyond the age of 80. “Screening mammography leads to the greatest reduction in deaths because it can detect breast cancer very early,” said Dr. Dawodu. According to Dr. Dawodu, there are four key risk factors for breast cancer. They include the BRCA 1 or BRCA 2 gene mutation, personal history of breast cancer, radiation treatment to the chest, and family history including certain rare genetic mutations. Dr. Dawodu said that any changes to the breast or breast pain should be addressed by a physician, and that they are not all indicators of breast cancer. Benign breast conditions can be caused by a variety of factors including medication, stress, natural changes and exercise. There are 200,000 new cases of breast cancer annually and Ngoc Pham, M.D., radiation oncologist on the medical staff of St. Joseph, said that treatment today represents a new era of advanced biological therapy. She provided an overview of the evolution of treatment from radical mastectomies in the 1890s to more individualized treatments for women today. Dr. Pham explained the advances in breast-conserving surgical treatments and radiation therapy. St. Joseph’s Pink Power annual luncheon is part of the hospital’s Women of Wellness (WOW) program. WOW is a health and social program to empower women as health care consumers by providing educational information and hosting fun, inspiring events that celebrate women’s roles in their own wellness. Membership in WOW is free and open to all women. To join visit sjmctx.org/wow or call 713-756-5051. St. Joseph Medical Center hosted its Third Annual Pink Power Luncheon to encourage women about early detection of breast cancer. Pictured are: Annette Garber, Director of Marketing and Public Relations; Tracie Gibbs, Marketing Manager; and Jamie Branting, Business Development Manager. 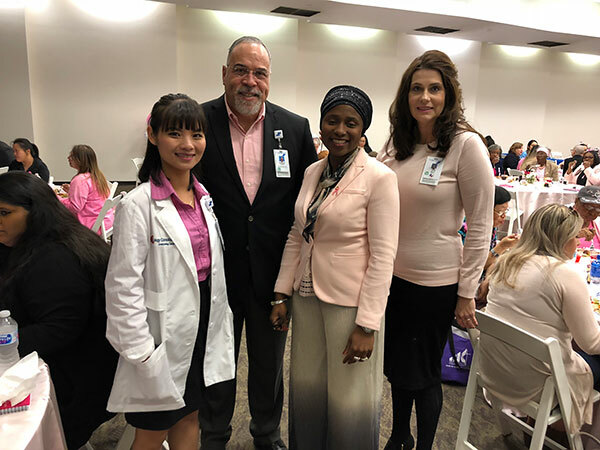 At the St. Joseph Medical Center Pink Power luncheon are: Ngoc Pham, M.D., radiation oncologist; Bernard Leger, chief operating officer; Eniola Mudasiru-Dawodu, M.D., radiologist; and Heidi Wolf, chief nursing officer.